A woman who launched the UK's first mobile chemotherapy unit after losing her husband to cancer has died of the same illness. 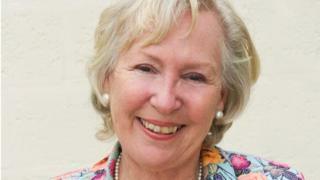 Christine Mills MBE, who founded Hope for Tomorrow in 2003, fought her cancer "with determination", the charity said. "Her loss is felt by many and her legacy will live on in the continued work of Hope for Tomorrow," it added. Ms Mills began the charity to ease the stress of patients who had to travel long distances for treatment. She wanted it to offer practical support to people with cancer and so raised enough money for its first Mobile Cancer Care Unit (MCCU) in 2007. Her husband David, who died of cancer of the spine, had to travel almost 60 miles from his home to the nearest oncology centre. The charity - which works in partnership with the NHS - has grown to now offer MCCU's in 10 places: Gloucestershire, Somerset, South Wiltshire, Hampshire, East Kent, Lincolnshire, Cornwall, West Suffolk, East Essex, London and Surrey. According to the charity's website, patients have been saved more than 2.5 million miles of travelling distance and more than 200,000 hours of travel and waiting time.